In 2010, the Our Lady of Victory Cemetery Board added a new statue on the grounds, replacing the statue of St. Francis that was destroyed by the visit of hurricane “Ike” in th e fall of 2008. Fr. 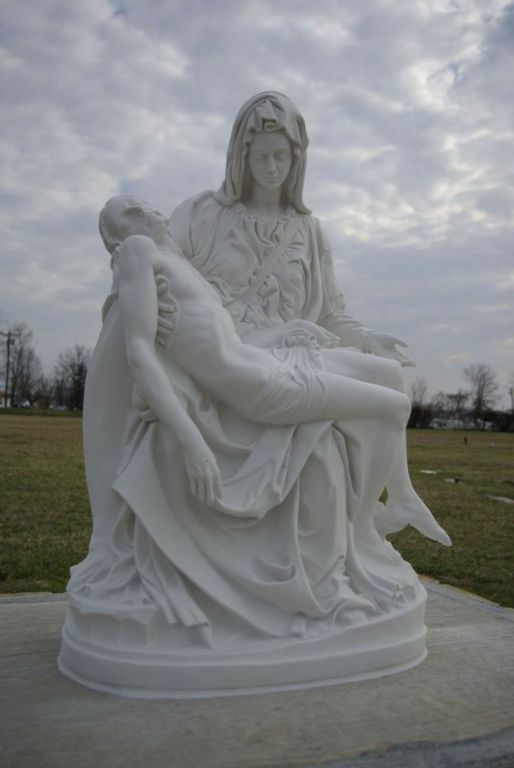 Reutter was asked to help search out an appropriate statue for the cemetery and he chose the Pieta (Mary holding the body of Jesus) made of an Italian marble composite material. Rather than just replace the old statue, the Board elected to design and build an area for meditation including a pedestal for the new statue. To enhance the area, some roses and perennials were added, along with dwarf Japanese maples to help provide a serene setting for visitors to the cemetery. The “Memorial Gardens” for the interment of cremains is located in the area adjacent to the statue.